"Chip Taylor's Last Chance" was widely recognized as one of the premier country releases of the early '70s. Hailed by Rolling Stone and many other music publications, the album became a benchmark against which many future releases would be measured. Taylor, already successful for hits many his as a songwriter, found his own voice on this release, which shines even more upon its reissue. 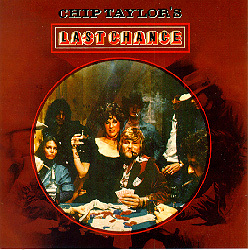 "For a while there it looked like "Chip Taylor's Last Chance" was going to go down in the annals of popular music as a lost classic -- a masterpiece beloved of cultists and aficionados, but denied a larger public by label marketing gurus and radio programmers who didn't know where to "niche" a record that rocked, twanged, crooned, sobbed and laughed all at the same time. But things have changed since 1973. It's now clear that "Last Chance" was merely twenty-five years ahead of the curve on the most vital and inspiring musical phenomenon of the late '90s: alternative country, or the Americana movement. Now re-released on CD, and sounding as fresh as the day it was recorded, "Last Chance" offers the world another opportunity to embrace one of the finest country-rock-singer-songwriter-pop-music records ever. How often in life to you get a second chance?"